The Hungarian pianist Annie Fischer died in 1995 after a long and successful career that brought her much acclaim, even if it never lifted her into the first rank of classical pianists. She was omitted from the Philips “Great Pianists of the 20th Century” set of CDs which featured recordings by 72 pianists. However, there has always been a body of opinion that feels her achievements were much greater than this would indicate, and since her death many recordings have been released to considerable praise. The present CD contains such recordings made in 1958 and 1960, all previously issued by different labels. They show Fischer at her best in repertoire at which she was most successful, and illustrate why many regard her as one of the finest pianists of her time. Stylistically her playing is at first unremarkable – in most respects her tempi and tone display no unusual features; in fact, the one aspect of her playing that might be considered a weakness is the lack of an instantly recognizable tone in the manner of Sviatoslav Richter, Vladimir Horowitz, Alfred Cortot or Wilhelm Kempff. But this is a weakness only at first glance: Fischer's somewhat neutral tone serves to underline a simplicity and profundity unencumbered by personality. Her phrasing makes even the most complex and profound passages instantly understandable – a skill particularly evident in her recordings of Beethoven's later Piano Sonatas. There are several recordings, both audio and video, of Fischer performing the Piano Concerto in C, K 467, by Mozart. The studio recording presented here features her with the Philharmonia Orchestra under a young Wolfgang Sawallisch. The recorded sound is good, although the piano sounds somewhat distant, as if the microphones were placed somewhere around the woodwind. It must be one of the best orchestral accompaniments to this Concerto on record: the ensemble is tight but warm, phrasing is light and graceful, and, possibly because of the placement of the microphones, the ensemble between piano and orchestra, especially the woodwind, is unusually transparent. Fischer herself plays with the characteristics familiar from her other recordings: without being overly intrusive, she shapes phrases in an entirely natural but rhetorical manner, often placing themes into a new light. Articulation and expression are always clear and precise, and her overall view of the Concerto is energetic without ever becoming excessively rhythmical. As in all her other recordings of this work, Fischer plays cadenzas by Busoni for both the first and third movements. As Mozart did not supply any himself, and no other composer has contributed a definitive set in the manner of Beethoven and the D Minor Concerto, pianists are obliged to be more experimental here. Busoni’s cadenzas are clearly stylistically complementary rather than matching, but fulfil all the expectations of what a cadenza should do, albeit with some extra combinations and perhaps more distant modulations than one would anticipate. The inclusion of these cadenzas underlines the more general problem of concerto cadenzas: originally intended as spontaneous contributions by the performer, they have increasingly become predictable parts of the concerto due to the high quality of the composer’s own cadenzas or those of other specific composers. It is difficult to justify playing Beethoven’s Fourth Piano Concerto and not to include one of the two cadenzas Beethoven himself wrote for the first movement, and so the many interesting and successful cadenzas written by others, such as Clara Schumann, never get a hearing, not to mention the performer producing one themselves. The few concertos that do not have an obvious choice, such as this one, are therefore rare opportunities to be imaginative without being overly wilful. The Concerto in A, K 488, is presented in a recording from 1960, also with the Philharmonia, this time under Sir Adrian Boult. Whilst the orchestral part is not as perfectly rendered as that in K 467, it is nevertheless very successful. The piano sound is again somewhat distant, giving the slow movement a little less impact. Fischer plays this sweetest of Mozart’s Concertos beautifully: it is as expressive and soulful as it could be without ever crossing the line into sickliness, a feat not always mastered in this Concerto, even by the greatest pianists. The slow movement in particular is moving, with genuine pianissimo throughout, the music restrained and introvert, allowing an unspeakable sadness to emerge without any trace of melancholia. Annie Fischer was famous for her performances of Bartok’s Third Piano Concerto, of which there are three released recordings to date. The version included here is the second of the three, recorded live in Munich in 1960, with the Bavarian Radio Symphony Orchestra under Ferenc Fricsay. It is a highly charged, atmospheric recording, the mystical opening perfectly captured, the serenity of the second as successful as in the similar movement in Mozart’s K 488, and last movement fiery and exciting. It is as convincing a recording as any, not dissimilar to the recording made by Dinu Lipatti and Paul Sacher. 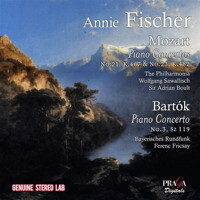 Overall, the recordings included on this CD are all well suited to introduce the virtues of Annie Fischer to those not acquainted with her playing – repeated listening can demonstrate the simplicity and vitality she brings to the music, as well as a sense of genuine profundity.